...an intense discipleship program. OSL is designed to help you set aside distractions and saturate your heart with the Word of God. It will kick your life to the next level: faith and confidence, joy and freedom, victory and wholeness are the results! This program is for everyone. At each of the 6 levels you will devote considerable effort into seeking God. You will have a coach to support you as well. We will train you to live by faith, hear God's voice, and walk in the calling God has for you. This creates an environment where each disciple is transformed by the renewing of their mind (Romans 12:1-2). OSL is not typical, nor easy; yet that is the strength of these classes. The intent isn't just to learn something, but to have God's Word and His power revolutionize each disciple's life so that they can say to others, "follow me, as I follow Christ!" Two words: hear God. If you give a man a fish you feed him for a day; if you teach a man HOW to fish you feed him for life. Many have been to church but have never been discipled. Most churches are designed to feed people; we are committed to teaching God's Word but also to training you HOW to feed yourself by daily coming to Jesus, hearing his voice, and doing what he says (Luke 6). God wants you to walk in his power and experience his fullness in you and through you to others. The key is to learn how to be led by God's Spirit through the Word-something many Christians long for but feel ill equipped to do. 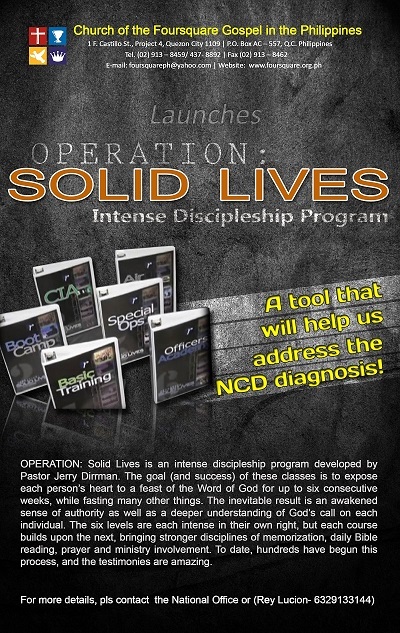 Level One: Level One is the first of six levels of Operation Solid Lives intense discipleship program. In level one, the students are introduced to spiritual disciplines that will cause the word of God to change their lives forever. The word of God fills you up through bible reading, journaling, listening to powerful teachings by Pastor Jerry, and bible memorization, and at the same time fasting from secular influences of the world which serve as daily distractions in our life. Whether you are brand new to the family of God or a mature believer, Basic Training will transform you through the power of God's Word. Level Two: As you continue the OSL program, you will be challenged to discover and rediscover the foundational truths of God's Word. Level Two is considered the most intense level because of the drastic changes that your life undergoes in order to no longer be "conformed to this world" but instead to the "transformed" by God's Word. You will understand God's covenat with us, reconcile his sovereignty with his promises, be filled with his Spirit, and learn to build a solid life. Level Three: Level Three is about the kingdom of God is His Word, without it, we're walking blind. In Level Three, students will discover the power of God's word in their daily lives, in prayer and in seeing the plan of God come to pass in our lives as we walk by faith. Students will also learn how to study the Word. Level Four: Now it's time to soar. Discovering the truths of the spirit realm will launch your faith to the next level! In Level Four you will understand your authority and grow in being led by the Spirit and ministering in the power of the Spirit. You will also go deeper in intimacy through worship and prayer. Level Five: We are all called of God to accomplish incredible things for His Kingdom. In Level Five you will learn to engage in your call (purpose) and walk worthy of the calling that have received. Each level builds a biblical foundation for the next level. All levels include powerful audio teachings, daily Bible reading and response journaling, Bible memorization and other key disciplines. Each student is assigned a "group leader" and placed into a small group for the purpose of encouragement and accountability. The classes run between 2 to 3 hours, depending on the level. Level One includes one in-class teaching weekly, while the others have two. Students hold to all disciplines for the entire class length and attendance at each class is required. Level One is four weeks, plus the Orientation Class. The rest of the levels are six weeks, plus Orientation. OSL Promo from Foursquare Philippines on Vimeo. The Foursquare Church Philippines is committed to fulfilling its mission to make healthy, holistic and harvesting churches by full operation and strong implementation of its Six Core Programs among local churches through the help and power of the Holy Spirit. Take a look at our other programs by clicking below. Many may think that the term disciple refers only to the early followers of Christ. We know that they were a praying, worshipping, loving, giving, and evangelizing group of men and women who refused to keep the truth of the gospel to themselves. Yet, God still desires disciples today - ordinary people like you and me whom God can use to do extraordinary things.